For this next post, I simply went off of a feeling I got from looking at this picture and the one below. The pictures were in hues of greys and it felt very masculine and heavy with strong lines and contrast. And then there was that fun bit of red color that would turn an ordinary drab photo into one of contrast and interest that draws you in. So my thoughts drew on the color, contrast, and the masculine feeling to think up these shoes. These are possibly the most loosely related to the pictures, though these pictures were the inspiration for them. They are made from a heavy, knobby grey/black tweed and I put a white masculine toe guard on the front with buttons that remind of spats to add high contrast. To add in the fun feminine element that makes the photos above really stand out, I made the toe guards have a scallop and there is a red rose on the front. They seem very tailored and old fashioned to me - almost turn of the century. They would be darling with some vintage clothing for a photo shoot. 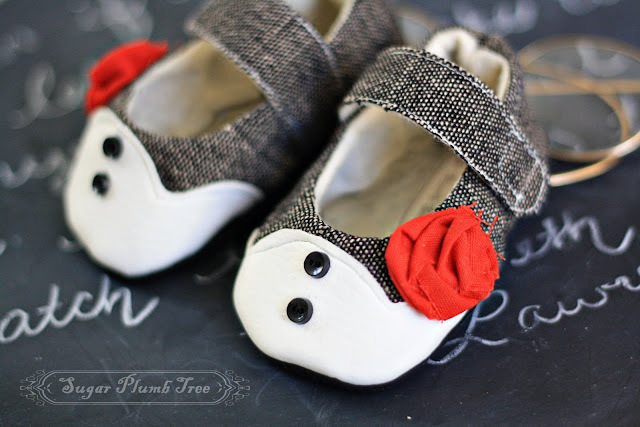 These are small and in a size 2 (6 months, 4.25 inches long). This pair is available below using the paypal link on a first come basis. Since they are one-of-a-kind, they are being sold for a little more than they would in my shop at $35 plus $2 shipping. These are my favorite so far! You are soooo talented. 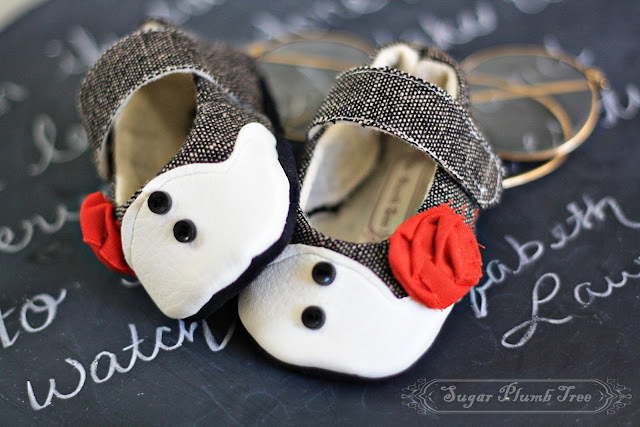 Simply adorable shoes! And I love those two photos too.